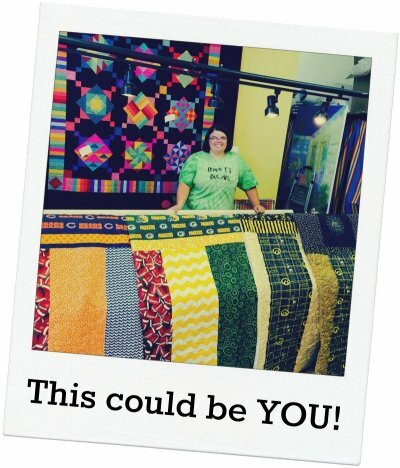 Do you want to finish your quilts & FAST? Then join us for one of our upcoming Longarm Certification classes! Our Longarm Certification instructor Marilyn Kidd is ready to show you how to use our APQS longarm quilting machine. Once you are certified you'll be able to rent time on the machine and finish your very own projects. Yesterday, customer Amanda quilted FOUR QUILTS in just half a day! Just imagine, this could be YOU! If the dates posted don’t work for you, please just let us know what date DOES work and we will do all we can to find a time that works for both of us. To give you the best possible experience, we limit the class to 2 students - encourage your quilter friend to sign up with you and you each receive a free hour of Rental Time if it is booked before December 15th. Set up a date today! ALREADY CERTIFIED on our Longarm? Refer your friend to one of our Fall 2016 certification classes and you will receive one free hour of rental with your next booking before December 15. Has anyone ever told you that you are not an artist? Then these classes are for you!! Have you ever told yourself that you are not an artist? These FUN classes will help you turn those unfinished quilt projects or your latest quilt tops into COMPLETED Christmas Gift Projects! It's simple and EASIER than you think! If the thought of taking a design class is intimidating….think of this as doodling on the back of an envelope. This method of quilting uses the blocks and piecing of your quilt as starting, stopping and ‘via’ points. If you have driven a car, you know that your eye naturally looks forward to the next place you plan to occupy as car and driver. Its that simple. You look ahead into your current land. You look to the side in the next lane if you plan to pass the car in front of you. You look ahead and to the side as you prepare to move back into your previous lane. It is a natural process if you are an experienced driver. In the same way, our eye looks ahead to the next point you plan to place your needle and thread. As with all things in life, we improve our skills with practice. Practice with a pad and pencil helps you to create muscle memory. Your practice on paper will become beautiful gentle curves, curves with a twist and spiral….on your quilt top! The options are limited only by your imagination! You say you don’t have adequate imagination? There is an easy solution!! Look at the designs right in front of your eyes….on your fabrics!! The the shapes you see inspire your designs or rely on those provided in this class from a book or photos you took on vacation! The suggestions are all around us, just waiting to be looked at in a whole new way! Check out the quilts in the shop for examples!! Ready to use a pantograph when you rent the long arm next time? Want to use a pantograph to complete another Christmas gift? Now is the time to gain this skill! You will love the results! Marilyn will show you how to set up and execute a simple edge to edge pantograph using the laser light on the side of the Hen and Chicks Studio long arm. You will learn what to do when you complete a row, how to advance the quilt and re-align your next row. You will love the variety of quilting you can do on your quilts! Check out the quilts in the shop for examples!! If you have completed the Hen and Chicks Long Arm Certification, you can practice during this class. If you want to utilize this new skill on your own machine - you are welcome to join us and watch! Class size is limited!! Sign up today! !